I just received my SIM card, purchased from FreedomPop. I placed it in my LG G3, also purchased from FreedomPop. Note that on my start up screen (the one you have the swipe to get to the homepage), there is a notice "No SIM card-Sprint"
I did a factory reset, and repeated the above steps, but still no luck. What am I doing wrong? I thought this should be easy, as both the SIM and the phone are from FreedomPop. @Carl Maltzman - You may have set aside the Sprint SIM that may have been in the LG G3 phone before. Please put it back into the phone. If it has an active account, it should get resynced with the Sync button. Thank you for the answer, but I don't understand. You are saying that the SIM cards you sell are not compatible with the phones you sell, as the SIM cards are LTE, and the phones you sell are CDMA? OK, I just educated myself on CDMA, GSM, and LTE. I see that on the envelope the SIM came in, it says LTE. I understand that the phone is CDMA. Do you sell SIM cards that are CDMA? Can I remove the SIM card from my FreedomPop Hydro and put it in my newer FreedomPop phone? 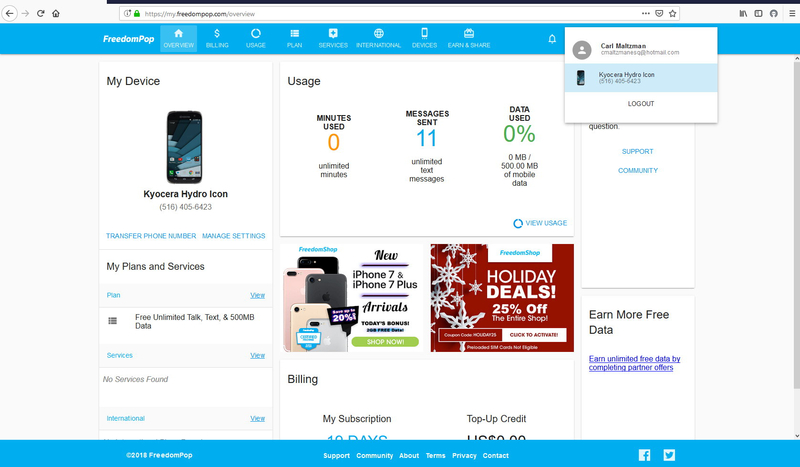 My phone shows as "activated" on the FreedomPop website. I replaced the Sprint SIM card. I do not see a "Sync" button. A message does come up, however, that says "Activation Step Required. Contact customer support to activate"
A message has also popped up, with the Sprint SIM card inserted, "SIM card removed. The mobile 4G network will be unavailable until you insert a valid SIM card." According to Sprint's specification sheet, the phone handles CDMA, GSM, and LTE. Perhaps if I unlock it the FreedomPop LTE SIM will work? How do I activate this phone? I don't need to use the LTE SIM card. If I can activate my LG G3 that would be great, as I don't use the cell phone a lot. As you can see, I already have another FreedomPop account, and that phone is my main cell phone; I obtained the newer LG G3 to run apps my "old" Kyocera Hydra can't. I can then deactivate the LTE SIM card account before the trial period is over and I have to pay for 6 months service that I can not use. Thank you again--in summary, please tell me how I can activate my LG G3. I do not see a reactivate option when I log in. Can I buy another FreedomPop phone with an included plan and then transfer that phone's SIM card to my LG? I meant buying a CDMA phone from FreedomPop with an activated account, and removing the SIM card and placing it in my LG G3. I did not make clear, I don't care about the LTE SIM card I purchased, and will cancel that account. I'd just like to get the LG working to supplement my other FreedomPop phone, which works fine, but the OS can't be updated anymore. So if I were to buy a FreedomPop phone on sale (I saw an offer for $20) I believe, and could switch out the SIM card to the LG, that would work for me. Thanks again for your patient help. Have a great weekend. The LG works, in that it works with WiFi. However, it of course can't make phone calls or text messages. The phone has a Sprint SIM card. It has the SIMGLW226R, which is the update for the original SIMGLW216R. But please note that when the phone is turned on, a message appears that says "insert valid SIM card for operation." That is not an email that I have created. It's not my email, so I don't have the password to access it.